You can see the speech-to-print approach at work in a short YouTube video we’ve published, showing an adorable four-year-named Buddy learning to convert the sounds he speaks into letters. This video clip says it all. I worked with Buddy for 11 sessions of about 10-15 minutes each. After 11 sessions he assembled letters to form the word FANTASTIC and could write the word himself. Stay tuned and watch as Buddy spurts ahead with each lesson, sounding out words and finding the letters. You can almost see his mouth and his brain working together. The letters he is using are what we are calling “Talking Shapes”. They are letters embedded in pictures that call to mind both the shape and the sound of the letter. 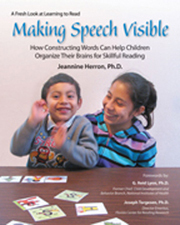 The Talking Shapes are available for everyone’s use at the back of Making Speech Visible. I hope this book will be as enjoyable for you to read as it was for me to write.